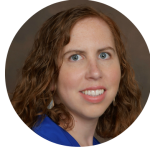 I’m so excited for this guest post on gardens of the Bible by my good friend Helen Cronin! Get ready for a great Bible study that will make your mouth water and your heart long for the God who designed us to work in the garden. That’s right…we were actually created for work, and work in the garden was our first job! 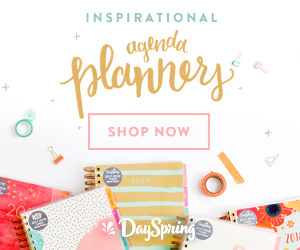 Learn more about God’s design for work and work-life balance here. By the way, if you can’t tell, Helen is from the UK. (No, Grammarly, I’m not going to change her spelling to the American way!) 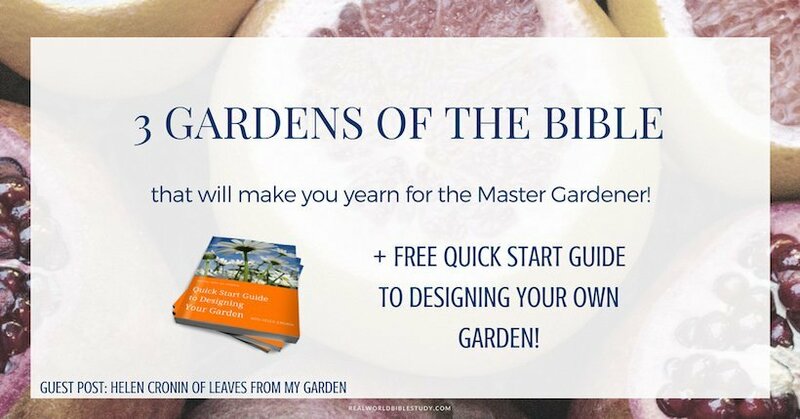 If you enjoy this post, you’ll love her free ebook on how to design your own garden! You may have heard the phrase “Life began in the Garden” but which garden and where? After the LORD God had finished creating the Universe, the sky, the stars, the land and the sea, as well as all the creatures within it, He created man. And the LORD God placed him in the Garden and asked him to tend it. The first garden, the first gardener, and the beginning of the first occupation of Mankind – gardening. It’s the first of the gardens of the Bible we think of: Eden (Genesis 2:15). Gardens of the Bible were places of beauty, shelter, and sustenance. The fruit trees and vines, fragrant herbs and other useful plants, as well as natural water supplies, were all key elements of design. The LORD God created the first garden, Eden (see below). 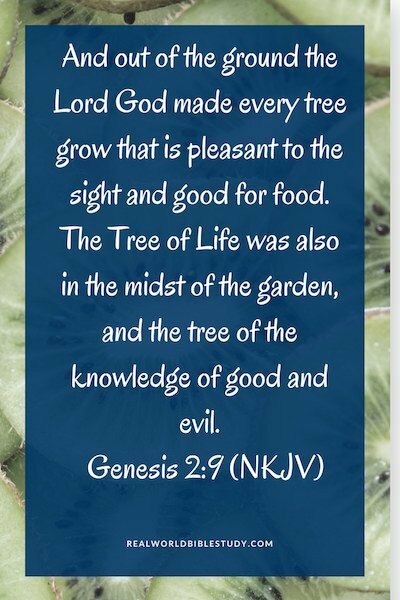 After Eden, the Bible mentions numerous gardens and their attributes. In the Song of Solomon 6:11 and Luke 13:19, a garden is referred to as a place of shelter and shade, and also as a place of protection (Song of Solomon 4:12). The garden mentioned in Esther 1:5 becomes the setting for a glamorous social event, when King Ahasuerus hosts a 7-day feast. It is also recognised as a place of provision of food in Jeremiah 29:5,28 and Amos 9:14. Gardens of the Bible are also seen as a place for quiet retreat and meditation (see Esther 7:7 and Matthew 26:36-46). In John 18:1-2 the garden is a place to meet with friends (more on this later). A second Garden of Eden is foretold in Revelation 22:2. At the end of time as we know it, there will be a new Heaven and a new Earth (Revelation 21:1) and a New Jerusalem. The New Jerusalem is to be planted with the Tree of Life. The trees planted on either side of the river that runs through the city will bear twelve fruits, each yielding its fruit every month, as well as leaves for the healing of the nations. (I just love that – “the healing of the nations!” – Joy). So what do we know of the very first garden which was probably located in the region of what we now call the Nile? “The LORD God planted a garden eastward in Eden, and there He put the man whom He had formed. God is the Master Designer, not only of you and me, and of the world in which we live but also of the first garden. But what did the Garden look like? Eden is synonymous with a place of perfect beauty, tranquillity, and flawless design. Many have tried to emulate it, and it is something we can certainly aspire to but in this fallen world, we will not be able to perfect it. My favourite garden and the one that is described in most detail is that which is found in the Song of Solomon. This book of the Bible is full of imagery and symbolism much of which the reader of its day could identify with. And we can appreciate the description of the garden from our knowledge of Gardens and Garden design today. In Song of Solomon 4:12-16, the garden is described as an enclosed (ie walled) garden. It has spring water and a fountain. There is an orchard of Pomegranates (today 10+ trees are commonly accepted as the definition of an Orchard). There are fragrant plants and herbs growing within the garden: Henna, Spikenard, Saffron (Crocus), Calamus, Cinnamon, Frankincense, Myrrh, and Aloes. The warm southerly winds bring out the fragrance of the garden, the cooler northerly winds carry the scent out of the garden and beyond. From other references within the Book, we can assume the pleasant fruit to eat (Song 4:16) could be Apples, Figs, and Grapes, as well as the Pomegranates already mentioned. Bees are not mentioned but the evidence of their presence is ie Honey and Honeycomb (Song 5:11). In Song 6:11 within the environs of the garden there is a green valley and a Nuttery (a plantation of Nut trees, possibly Almonds as mentioned in Ecclesiastes 11:5). In the Garden of Gethsemane, the closing chapter of the plan of redemption begins. 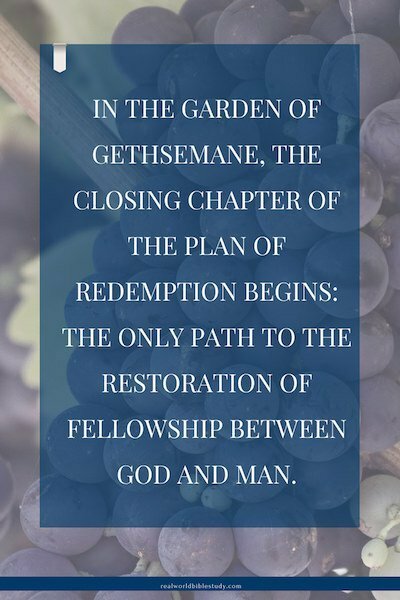 The only path to the restoration of fellowship between God and Man. In the first garden, Eden, the LORD God and Adam fellowshipped until Adam and Eve betrayed that bond through disobedience. The plan of Redemption is revealed with the sacrifice of the first animal; the shedding of blood and the covering given to Adam and Eve (Genesis 3:21). In the garden of the New Jerusalem, once again Adam and Eve – you and me – will get to walk with the LORD God. In the Song of Solomon 8:13 there is a symbolic instruction which may also be taken literally. For many, our gardens today are a place to meet with family and friends. But as we work in them and enjoy them, we can reflect on the gardens of the Bible and what took place in them. Then our gardens too can be a place to fellowship with our LORD God, the Master Gardener. Helen loves to help people turn their ordinary places into beautiful spaces. 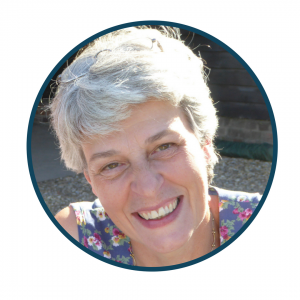 She writes about Garden design, gardening projects and her Garden on her website www.leavesfrommygarden.co.uk. 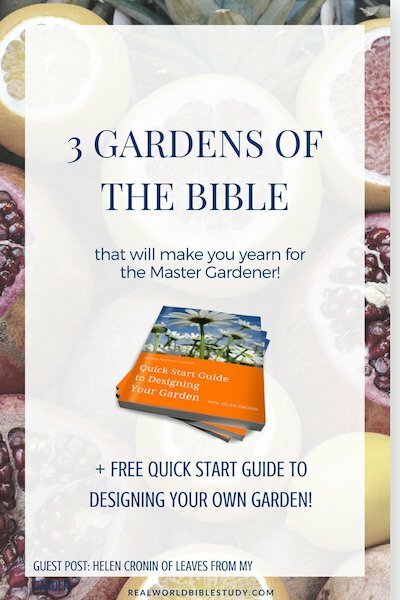 If you would like to know more about how to create your own Garden, Helen has a free book: the Quick Start Guide to Designing Your Garden – You can ask for your copy here. Seriously! My own garden got eaten by the rabbits and snails (except some corn and onions that are doing ok) and I’ve been putting off replanting because it’s so hot! It’s a good thing I walk by on my way in the door every day because I keep having to water extra! And doesn’t Helen’s writing remind you of opening up a storybook?